There were two toll roads out of Exeter, on each side of the river. One ran from Red Cow towards Tiverton, along Cowley Bridge Road, and the second route ran from the Seven Stars Inn by the Exe Bridge on the Okehampton Road towards Cowley and Crediton, through Exwick. In 1852, James Wentworth Buller, had Station Road cut from St Andrew's Road to Red Cow. 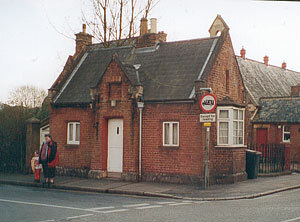 A toll house on the corner of Station Road would serve two routes, one a turnpike, the other a private road. The Flying Post had the first intimation of a new toll house at Exwick on the 9 December 1852 with "It was resolved to erect a toll-gate and bar at Exwick, so as to catch the traffic which will pass over the bridge which has been lately thrown across the Exe. A grant of £100 was also made for the erection of a new toll-house at the Three Horse Shoes." The Turnpike Trust were obviously worried that traffic would cross the Exe to enter Exeter from St Thomas, rather than pay a toll at Red Cow. On 11 February 1853, a contract was signed to build the new facility. The cost of the building was a £100 and the bill for the construction was paid on the 20 May 1853. 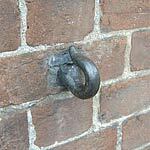 A hook was placed in the wall of the toll house, on Exwick Road, that would hold the chain that stretched across the road to the boundary wall of the manor house. In the order book, for the construction, of the 1 December 1852 was the following comment – "The materials of the house at the Three Horse Shoes be taken and used." In 1855 tolls were imposed on the Station Road side and Buller allowed the 'labouring classes' to pass along the road for free with a board at the toll house stating "Private Road - No passing without payment of toll, excepting for foot passengers." There was a bar across the road to ensure that traffic stopped, but the occasional dispute over payment was reported in the Flying Post. In 1884 the building was sold to General Sir Redvers Buller for £60, and although its function as a toll house for the Exeter Turnpike had ceased, it was still used to exact tolls for Station Road. Station Road was adopted by the City Council, and on the 30th September 1901, the Mayor declared the end of tolls for the road. The vicar, the Rev. L P Williams-Freeman wrote of the day in the Exwick Church Magazine. "On Mon Sep. 30th. a funeral took place. It was the most largely attended funeral I have ever seen. In fact the whole parish turned out to witness it. It was the funeral of our toll gate. Rather than signs of mourning, there were signs of rejoicing. The ceremony was conducted by the Mayor of Exeter (Mr A R Dunn) and about 30 members of the Corporation acted as pall bearers. The day was beautifully fine, and what a day we had! Punctually at 10am the Mayor arrived, and robed in the schoolhouse. Besides the members of the City Council, we also had the macebearers and the Cap of Maintenance carried in front. We formed up in procession and marched to the tollgate where I delivered an eloquent address. (I say "eloquent", because this magazine will be read 100 years hence). The Mayor replied in words almost as eloquent, and then seizing a crowbar, he dug it into the ground and with one mighty wrench, he uprooted that miserable toll gate and it fell to the ground with a mighty crash. The bystanders were too stupefied by this amazing feat of strength to cheer as loudly as they would have wished to do; still, they did cheer, till their cheers were cut short by the strains of the "old Hundredth" (Psalm 100) sung by the school children. All present heartily joined in the Doxology, after which the procession reformed, and we proudly paced the whole length of our newly freed road to the bridge and back, the bystanders looking on with awe and admiration. 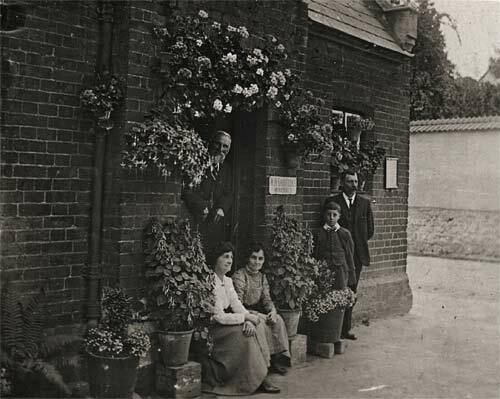 We then returned to the school, where light refreshments were served to our visitors and the great function of the day was over; but the rejoicings were not over by any means. For in the evening, a wondrous procession of decorated prams, barrows and bicycles, was organised by Mr A H Rousham, and this procession headed by the band of the Exwick Company Church Lads Brigade, paraded the same newly freed road, amid a blaze of Bengal lights. The fun grew fast, furious and uproarious, and it was carried on far into the night. At 8pm all the householders in Exwick were entertained at dinner in the Lamb Inn, by the kindness of Alderman Mallett. A capital dinner was, enlivened by songs & speeches of the highest order. If one or two persons had no invitation it was their own misfortune and certainly not the fault of Mr Mallett, who desire it was to ask everybody, and who did ask everybody he could think of." The toll house was the last Exwick property owned by the Buller's to be sold out of the family in 1988; it is now a very small, private house. Sources: Flying Post, Transactions of the Devonshire Association and research for Station Road. Extract from the Parish Magazine was found by Julia Sharp. Top photo Alan H Mazonowicz.